Julius Peppers is bound to be a cap casualty as soon as his replacement is found. With Free Agency just over five days away, each fan base dreams of what their team(s) will accomplish this off season. The salary cap jumped up exactly $10 million from a year ago, with that comes more cash to spend. While the Chicago Bears appear to be strapped for space, there are many ways the team can create extra space. As of right now, the team currently projected to have right around $9.36 million to work with after the recent signing of Jeremiah Ratliff, who is projected to have a $1.4 million cap hit this season, according to ESPN”s Michael C. Wright. With that being said, there are a few “hidden” costs to go over before we get started. After the hidden costs, the Bears technically only have about $.36 million to work with. Don’t fret though Bears fans, the team will have the full $9.36 million going into the off season to spend, without having to account for the hidden costs. Now, for some good news. The team could save $17.25 million in cash with four realistic cuts. Along with that, the “Automatic Conversion” clause placed into Cutler, Jennings, etc contracts can provide the team with an extra $14 million in relief as well. The clause sounds great on paper and does not carry a penalty but the team would in turn create that money into a “bonus” to be spread through future years, thus, creating a higher cap hit over that period. In this scenario, no money was borrowed and the team still had a small amount of wiggle room, even after the hidden costs. Backloads will be the key this year, much like it was last year. Just remember, Bushrod, Bennett, Slauson, Williams, and Anderson were all signed for under an $8 million cap hit last year. All five started. With the basics out of the way, lets get to my projections to how I see Phil Emery working this off season. 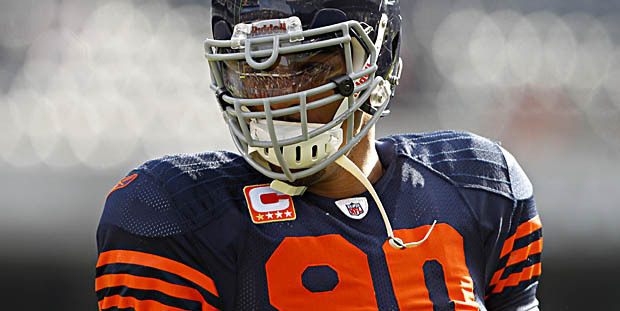 Julius Peppers (Defensive End)- $9.8 million cash savings/$9.38 million in cap savings. Eric Weems(Wide Receiver)- $1.1 million cash savings/$.68 million in cap savings. Earl Bennett (Wide Receiver)- $1.5 million cash and cap savings. With Cutler, Jennings, Slauson, Gould, Fiammetta, Garza, Ratliff, Boggs, Rosario, and Hayden already being retained and counted into the cap projection, I will not cover their contracts. Corey Wootton (Defensive End)- 3 years/$9 million. ($1.5 million cash hit) $1.08 million cap hit. Zachary Bowman (Cornerback) 2 years/$2.5 million. ($1 million cash hit) $.58 million cap hit. DJ Williams (Linebacker) 1 year/$.8 million ($.8 million cash hit) $.38 million cap hit. Eben Britton (Offensive Lineman) 2 years/$2 million ($.8 million cash hit) $.38 million cap hit. Craig Steltz (Safety) 2 years/$2 million ($.8 million cash hit) $.38 million cap hit. Patrick Mannelly (Long Snapper) 2 years/$2 million ($1 million cash hit) $.58 million cap hit. Sherrick McManis (Cornerback) 2 years/$2 million ($.88 million cash hit) $.46 million cap hit. Total cap hit: $3.84 million. Defensive Ends Austen Lane and Trevor Scott have already been accounted for in the cap. Michael Bennett (Defensive End) 4 years/$30 million ($3.5 million cash hit) $3.08 million cap hit. Bennett has been the talk of many teams during the start of the off season period. With his brother already here and Seattle not getting a deal done, the writing might be on the walls. He will step in and become the number one guy. Linval Joseph (Defensive Tackle) 4 years/$24 million ($3 million cash hit) $2.58 million cap hit. At just 25-years-old, Joseph will fly under most fans’ radars as a prime off season target. He may not be a pass rusher but he’s a big body up the middle and a ever improving run-stuffer. If the price is right, Emery will have a hard time looking him over. TJ Ward (Strong Safety) 5 years/$35 million ($3.5 million cash hit) $3.08 million cap hit. Ward or Byrd? The debate lives on but for this team, Ward fits the bill better. With Conte returning and the projected starter, a strong safety to the caliber of Ward will do nothing but help him. Ward is a hard hitter, great in the box and underrated in coverage. Value is not as high as his counterpart, Byrd. Willie Young (Defensive End) 2 years/$3 million ($1 million cash hit) $.58 million cap hit. Most may recognize him for his play with the Lions. He’s not a stand out player or a starter but any good line, needs a good rotation. This is what Young will bring. He’s more productive than his number suggest and is solid depth for the price. Donald may be the second best defensive lineman in the entire draft. Knocked for his size, the kid simply produces. He averaged 1.5 sacks and 2.4 tackles-for-losses a game in 2013. Great fit at 3-tech after Melton departs via Free Agency. Even with Ward being brought in at Safety, the team still needs a long term option to groom after Conte’s contract is up this year. Bucannon has good size, speed and ability. He is a hard hitter and most importantly a play maker. At 6’3, McGill draws comparisons of Richard Sherman. Although he is still raw, McGill would be a great candidate to sit behind a veteran like Bowman for a year and simply develop. He is also very versatile and could convert to safety if needed. Good value this late. Before his ACL tear, Mettenberger was a 2nd round pick. Some may feel he won’t last until here but with that injury, this seems like a very realistic spot. Has great ability and could develop behind Cutler for the next few years and pull a later round Aaron Rogers. Also has great size at 6’5 & bring mobility. Fits Emery’s mold. Before the combine, Archer was mostly an unknown commodity but after running the fastest 40 time, he is now in the spotlight. It is no secret that the Bears could use a versatile “weapon” to stretch the field in a few different looks. Archer and De’Anthony Thomas are the most likely to fit this role. After a pretty good combine outing, Lyerla has grown on many. At 6’4, he has good size and brings better speed than most anticipated. Would be a good prospect to develop as the number two Tight End behind Martellus. Another Sooner? Yes, you read this right. Roberto Garza signed another one year deal to remain the Center for another season but the soon to be 35-year-old is obviously not the long term option. Ikard may not be high on many boards but he fits the bill for the Bears. Good size and best suited for a Zone Blocking Scheme, Ikard could be a steal with the last pick.